This guest house is located in Brush Prairie, WA on 5 private acres. The house has an open loft bedroom area that is semi private, with a vaulted kitchen and great room/dining area. Very comfy and nicely appointed. The kitchen has granite counters, stainless steel appliances, barn wood flooring, vaulted ceilings, new light fixtures and a fresh new coat of paint. The home has a 3 car garage plus a shop area. About 850 sq. ft. Plenty of parking..... Satellite TV, high speed wireless internet. Hot tub is available for your use as well and during the summer months the pool is open for use as well. Traveling with horses? We have space for them too! We have a barn with 5 stalls and an indoor riding arena. Additional fee for the horses but we have room for several. At this time we have none of our own. Owner is usually located on site in the main house. Guest house is located on the opposite side of the property and offers a nice sense of privacy. There is a fire pit for smores - when burning season is open. 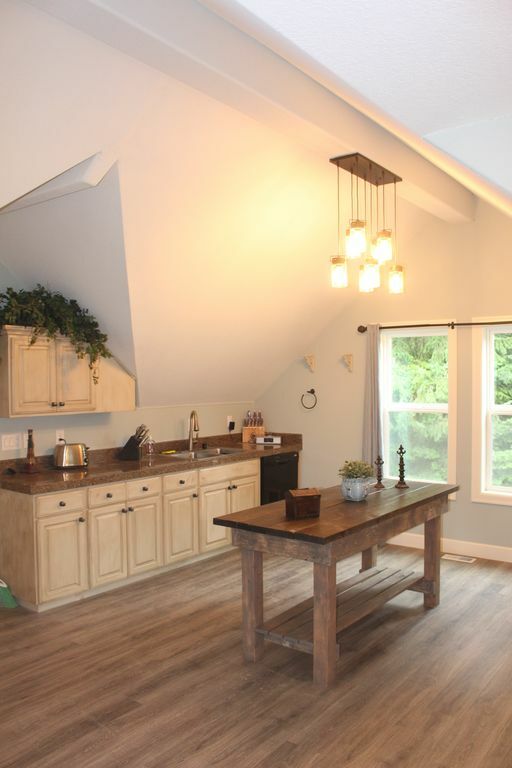 Beautiful kitchen, vaulted ceilings, nicely appointed.